How do I set a default grade for an assignment? 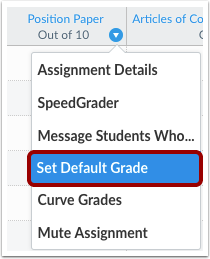 If you want to set a default grade for a certain assignment, use the assignment drop-down menu. This will allow you to input scores for students who do not have scores or to overwrite already entered scores. 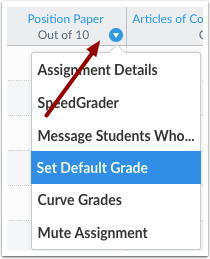 Note: When Multiple Grading Periods are enabled in a course, you cannot set a default grade for any assignment that has at least one student in a closed grading period. 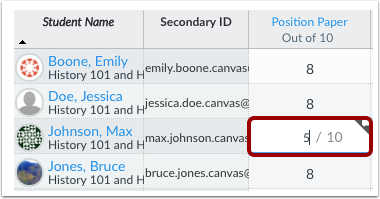 Hover over the assignment title and click the drop-down menu. Click the Set Default Grade link. Type the default grade value in the text box . If you would like to overwrite existing grades for the assignment, select the Overwrite already-entered grades checkbox . Click the Set Default Grade button . 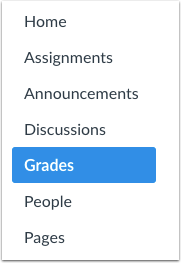 Click the OK button to view the new default grades. Default grades are automatically entered for all students who do not have a grade. Grades can be changed by clicking the default grade and typing in an updated score. Previous Topic:How do I send a message to my students from the Gradebook? Next Topic:How do I curve grades in the Gradebook? Table of Contents > Grades > How do I set a default grade for an assignment? 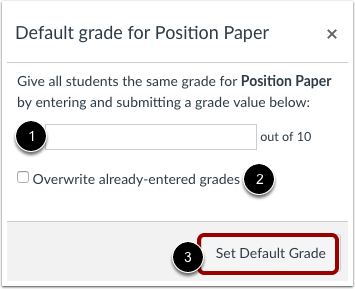 Re: Entering Default Grades: Entry box must be clicked on twice. Re: Treat Ungraded as Zero? - Does it work or not? Re: Can't I bulk enter points in Canvas?